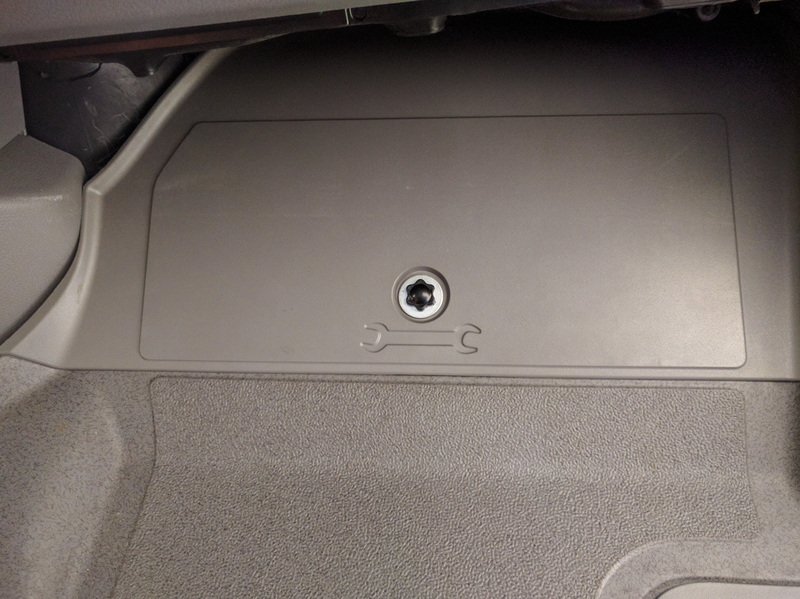 The tool cover in the passenger footwell has a push-in/twist-out clip that seems to never push in properly and always twists out at the wrong time. We replaced it with a screw-in/screw-out solution that holds the cover in place really well. We’ve got some Thinsulate insulation against the firewall and under the jack and lug wrench in the tool area of the passenger footwell. It adds depth behind the tool cover. That means the stock clip for the tool cover just doesn’t work. So we swapped it out for a stronger solution. We used an M6 threaded knob, a fender washer like these, and an M6 clip nut. We used a flat clip nut like these, but if you have access to a friendly IT person at work, they’ll most likely have hundreds of rack mount style ones you could use instead. The clip replaces the metal clip on the attachment point under the cover. The M6 knob just screws in to it. The fender washer is not strictly necessary but it prevents the plastic cover from getting marred. Over 2000 miles on this modification with no complaints so far.